For an anime as widespread and culturally recognised as Dragon Ball Z, it has actually inspired some pretty decent games over the years. Any given cross section of my free time over the past decade has probably included a healthy dose of the Budokai or Budokai Tenkaichi series. 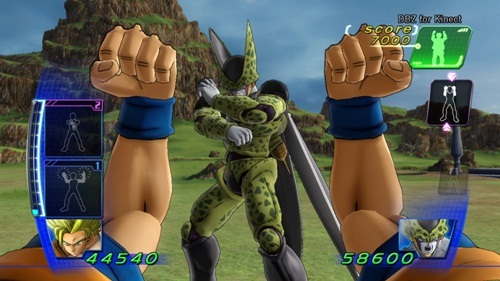 The recent iterations on current gen consoles have been poor by comparison, but the recent effort for Kinect marked a chance for redemption for Akira Toriyama’s martial arts opera. Or at least it should have seen a break from the tedium of the Raging Blast games, but DBZ for Kinect is just as lacking as its recent predecessors. Dragon Ball Z for Kinect takes players through the classic sagas of Dragon Ball Z but, unlike other Dragon Ball titles from past, present and future, only the core DBZ sagas are covered. No GT episodes, none of the films, no classic Dragon Ball fights, just the Saiyan, Frieza, Cell and Majin Buu sagas. It’s a bit disappointing to be lacking any of the extras, especially when it reduces the character count far below that of other DBZ games. Still, it wouldn’t matter if the game was actually fun, but that sadly doesn’t wind up being the case. Guarding: Just one of the many essential functions that seldom works. 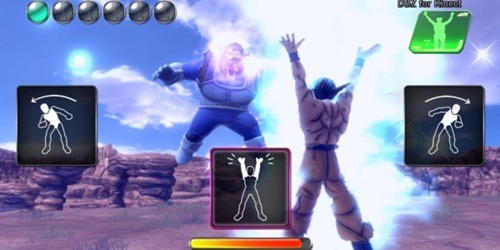 The bulk of DBZ for Kinect sees you punching and kicking the air in the hope of reaching your virtual target. The game plays out largely from a first person perspective, with your moves being replicated on screen. This part of the game actually works surprisingly well, with the motion detection functioning with at least a vague degree of accuracy when it comes to basic hand to hand combat, but the various punches and kicks you can perform don’t really offer any variety, meaning flailing your limbs is, sadly, the best option in most short range scenarios. A swift jumping motion will switch you between melee range and blast range. Blast range is almost identical to close range, but your jabs turn into ki blasts rather than standard punches. 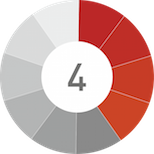 It works well enough, but the different ranges don’t add the kind of variety you’d be hoping for. It also epitomises the sheer amount of scripted mini-game style sections that occur in the average battle. After merely a few minutes with Dragon Ball for Kinect, you’ll realise just how QTE heavy the game is. Switching between melee and blast ranges, special move locks and hitting with a flurry of attacks all shift you to a scripted event, usually involving flailing your arms around as quickly as possible. It’s dull, brain-dead and happens far too often. It wouldn’t be too big a stretch to claim that about 80% of the game occurs as quick time events. It wouldn’t be too far off the mark to describe DBZ for Kinect as little more than an elabourate QTE. The sad thing is that the scripted elements are almost preferable to the free fighting where, outside of the most basic of gestures, the motion detection is diabolical. Built up smash strikes and ki blasts are where the problem first rears its ugly head, requiring you to hold your hand above your shoulder for a few seconds before jabbing the air as usual. The problem is that these mildly complicated precursor stances are never picked up all that well. The same issue sadly extends to the special moves as well. 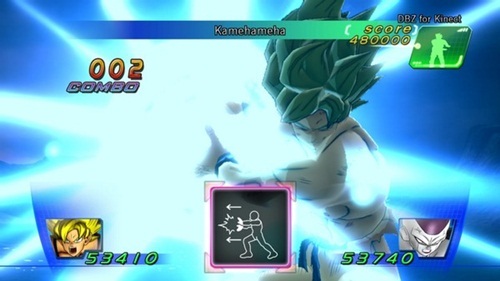 The special moves are easily the highlight of the experience, with beefy kamehameha waves crashing through the air, but they are a real pain to activate. Basic energy waves like the masenko and Krillin’s destructo disc aren’t too bad, but rush attacks like Kaio-ken require some truly maddening gestures. It’s not that the actual stances are at all difficult, but your Kinect sensor will ignore them nine times out of ten. This same lack of body recognition occurs when you attempt to use your ki charging stance, arguably one of the most essential functions in the entire game. You spend so much time trying to successfully charge your ki energy that the battles are often slowed to a laboured crawl. It doesn’t help that charging up to a full bar of ki can take a whole minute, and at least half a bar is used with each special move. Maybe it’s this, or maybe it’s because the dodgy artificial intelligence has been made to play leniently to accommodate how much time you have to waste getting the Kinect to recognise your moves, but, either way, the battles are frustratingly paced. The specials look great, but they aren’t worth the time it takes to charge them up. When you do actually get to use the special moves though, they are a delight to behold. Energy waves crash through each detailed stage and rush combos show off the game’s gorgeous animations. Dragon Ball for Kinect looks pretty awesome in general, capturing the anime aesthetic of the DB universe effectively. The audio is spot on too, with familiar sound effects, cringe-worthy J-rock tunes and the classic English voice cast we’ve come to love (or at least accurate sound-a-likes). Should you be lucky enough to be able to see DB for Kinect without actually having to play it, you’d be quickly fooled into thinking it was a quality product. Dragon Ball Z for Kinect is ultimately yet another game with a solid concept completely ruined by Kinect’s myriad deficiencies. The motion detection just fails to sense the complicated gestures required to play the game, a problem that creates the knock on effect of battles occurring at a dull pace. The issue of repetition is also a real deal breaker. Despite how decent the stages and character models look, each character and level is almost identical to play, bar a few different special moves here and there. That so much of the combat plays out as on-rails QTEs also makes each battle play out in a near identical fashion. The lack of any kind of online or local multiplayer modes is also dissapointing for a traditional fighting game. It adds up to a game that gets very old very quickly. Having played just about every Dragon Ball game under the sun, this has got to be one of the worst. Even if you’re a big fan of the series, purchase this game at your own peril.